The term T-girls celebrates a range of trans identities. Michael Langan talks to Darius Amini about his exhibition, Gender Outlaws, and how it celebrates the diversity of identity. 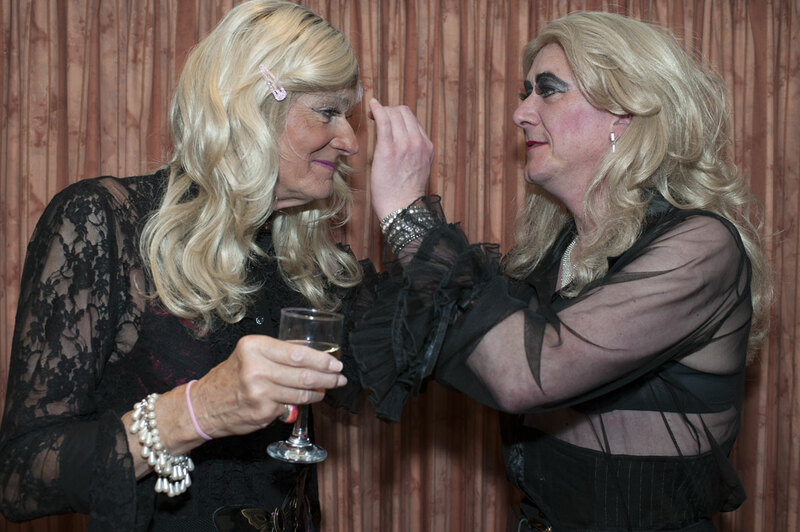 Gender Outlaws, a new exhibition by Darius Amini hosted at The Camera Club in South London, is a series of photographs of T-Girls in Manchester. It represents and celebrates a variety of identities and gender play, but in a way that isn’t just about nights on the town and the club scene. Before speaking to Darius I hadn’t heard the term T-girls before. Darius himself first encountered it when he started photographing the T-Girls in 2013. “It’s a general term that includes cross-dressers or transvestites, transgender people and transsexuals, all as sub-divisions within it,” he explains. “These specific labels many T-Girls find a bit limiting and a bit stereotypical.” In this way, T-Girls seems to function in the same way as the umbrella term ‘queer’. One of the T-Girls, Lisa, affirms this. “It means I am somewhere on the gender spectrum between male and female,” she says. “T-girls are not men, nor are they women, they are both, and embody the best and worst aspects of what it means to be both.” For Lisa, such gender ambiguity “holds a mirror up to social and sexual interpretations of gender.” Samantha, another of the T-Girls, says the term simply describes someone who cross-dresses, while it “allows the exploration and development of another identity.” For her, at least, it’s not life changing – this is her life. When Darius was looking for more people to get interested in his project he joined the website, TV-Chicks, a social network for T-Girls. “There’s a drop-down menu on there including all the various categories that people put themselves under, and the website embraces a whole range of identities and people.” TV-Chicks is mainly a directory of bars and clubs and places for T-Girls to meet, as well as a forum that enables their admirers to contact them. There’s a tendency for people to cast an eye over T-Girls and, depending on how young, gorgeous and fabulous they look, this determines how accepted they are. For Darius this fact is very much part of his thinking when choosing his subjects because many of them don’t conform to certain stereotypes. “You only have to flick through the pages of any gay magazine,” he says, “to see the people they choose to photograph in clubs – they’re all of a certain age, with a certain look, which I can understand but which doesn’t really help anyone. I do loathe that weeding out of the unsuitable faces. I think we need to celebrate the diversity of who’s out there. In these increasingly right-wing times we need to broaden our outlook, not narrow it down.” With that in mind he sees this project running for some time, widening it to an international forum. He also plans to include more explicitly various and diverse ideologies around T-Girls’ identities and rights. What Darius would really like people to take away from the exhibition is an increased awareness of the diversity within the T-Girl community, and to be surprised by that. Samantha’s hope is that “people will see that, though the T-Girls present their ‘alter ego’ seriously, this is also done with a huge sense of fun and humour.” Darius’ photographs manage to tread that line effectively and thoughtfully – confronting, challenging and celebrating in equal measure.